Italian Prime Minister Silvio Berlusconi (right) has vowed to step down, but that didn't keep 10-year bond yields from hitting record highs. NEW YORK (CNNMoney) -- Italy's borrowing costs continued to surge for a third day Wednesday, with yields on 10-year Italian bonds climbing above 7%. The surge comes a day after Prime Minister Silvio Berlusconi agreed to step down, a move that did little to quell investor fears about Italy's debt problems. The 7% level is significant because that was the mark Ireland and Portugal crossed shortly before receiving bailouts from the European Union and International Monetary Fund. Ireland's actually rose above 8%, while Portugal's breached 9%. And yields for Greek bonds touched the 10% mark. The run-up on Italian bond yields comes despite a rush of buying by the European Central Bank, which has been struggling to keep those yields below 6%. Italy has been under pressure from investors and its trading partners to get its fiscal house in order. The nation has debts equal to about 120% of its overall output and an economy that has been stagnant for years. As the eighth-largest economy in the world and the fourth-largest in Europe, Italy is seen as vulnerable to the debt crisis that has brought down Greece, although economists say that Italy remains solvent. Italy's economy is largely driven by manufacturing and industries that include chemicals, pharmaceuticals, motor vehicles and clothing. And its bond market is the largest in Europe. Berlusconi's resignation announcement was designed to address Italy's lack of "credibility" in the financial markets. But the timing of his departure is unclear and any new government will still be hobbled by gross debts expected to reach €1.9 trillion by the end of the year. "The real danger is that the country will drift rudderless and without proper leadership for weeks if not months while politicians negotiate the future course," said Eoin Ryan, analyst at economic research firm IHS Global. Italian president Giorgio Napolitano tried to calm markets in a statement issued Wednesday. 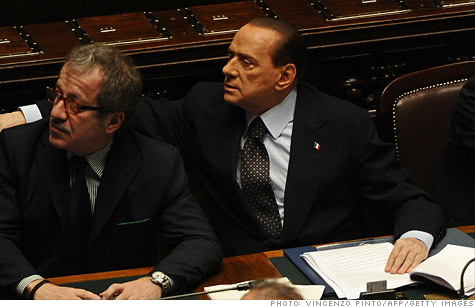 He said Berlusconi's plan to step down is not in question and a new budget could be approved within days. "Therefore the fears that there could be in Italy a prolong period of government and parliament inactivity are groundless," he said. "Also, it is possible at any moment to adopt, if necessary, emergency measures." Italy's projected debts are 2.7 times larger than the debt of Greece, Ireland and Portugal combined, according to Gary Jenkins, fixed-income analyst at Evolution Securities. "While there has been much talk of Italy being in a different position to Greece, with only a small overall deficit and a primary surplus," Jenkins wrote in a note to clients. "The fact remains that it has a large amount of debt outstanding which needs rolling over and will remain the case even if it sticks to its targets and achieves a balanced budget in 2013." Italy needs to refinance €300 billion worth of debt next year, and a similar amount in 2013, according to Jenkins. He estimates that the EU could face a total bailout tab of €1.4 trillion if Italy needs to be rescued. "The EU has just not got enough committed money available to cover that kind of amount," said Jenkins. "Given the size of the economy and the amount of debt involved Italy cannot be bailed out, but it cannot be allowed to go bust either." To help restore confidence in the markets, the European Union has proposed leveraging a €440 billion government-backed rescue fund up to €1 trillion. But certain aspects of the plan remain unclear, including what role non-EU investors will play in boosting the fund's lending power. The goal is to create a credible lender of last resort for government debt. But the current size of the EFSF is widely seen as insufficient to deal with Italy's financing needs. In the meantime, the ECB will be under increasing pressure to step up its buying of Italian debt. The ECB has also been buying billions of euros worth of Spanish bonds as the government in Madrid is also struggling with unsustainable debts and weak economic growth. -- CNNMoney's Aaron Smith and CNN digital producer Irene Chapple contributed to this report.